The Addison Chamber Choir is an auditioned choir of between 30-40 voices who sing a large repertoire but have become particularly known for the performance of music by a wide range of contemporary composers, many of whom have written pieces especially for the choir. Most recently the choir performed at the Americana Festival at St John’s Smith Square and ‘Parry and Beyond’ at St Paul’s Covent Garden. The choir regularly sings at St Martin’s in the Fields as part of the Brandenburg Festival, King's Place and venues across London. In July 2018 the choir went on tour to Isle of Man and performed a range of contemporary works with local choirs. Addison Chamber Choir frequently joins concerts given by the Addison Oratorio Choir, often having their own performing spot and making a pleasing contrast to the larger scale works sung by the bigger choir. A high level of commitment and rehearsal attendance and practice at home is expected. Please see further information about the informal audition requirements. A bursary to attract and retain enthusiastic singers with financial needs, who demonstrate exceptional talent and wish to join the Chamber Choir may be available on application from the Membership Coordinator (please specify Classical Choirs Bursary in the subject field). The bursary covers all fees and music for one year and is conditional on also joining the Oratorio Choir and committing to singing at all Chamber and Oratorio Choir performances during the year. The repertoire is extremely varied including contemporary composers such as Judith Weir, John Ireland, Eric Whitacre, Howard Skempton, Gavin Bryars and more widely performed works by Mozart, Vivaldi and Bernstein. 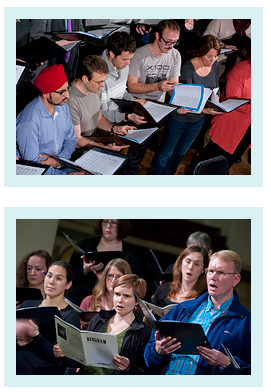 Auditions for the Chamber Choir are usually held at the beginning of each term. Successful applicants are asked to commit themselves for a minimum of a term to include the concert or ideally for longer and to participate in at least 75% of the rehearsals. When to apply To apply to audition for the Chamber Choir, please fill in the online form. Auditions are held at the beginning of each term. The exact date for the start of each term will be given on our dates page. Format of audition Your audition will be with the Music Director with an accompanist and should take no more than about 10 minutes and will include: - a few vocal exercises - some sight reading - performance of a piece you have prepared. How to apply If you would like to have an audition, please fill in the online form or if you have any queries, contact our Membership Coordinator, or phone 07531 447960. She will be able to help with further information and arrange a time for you to attend an audition prior to rehearsals starting. If you are interested in joining the Chamber Choir please read the information about auditions. If you have completed a successful audition, please enrol online by first registering here on the Addison Singers website, then purchase a Chamber Choir membership, click on Checkout and choose a payment method. You will receive a confirmation email. Please contact us to ask about enrolling after term has started. Any potential new member to one of the auditioned choirs will be invited to do their audition and then, if successful, will be invited to stay for that evening's rehearsal. At the end of which you will be asked to complete the enrolment online and make the appropriate payment. Concessions apply to people who are registered unemployed or disabled, and those receiving Income Support, Working Family Tax Credit, Invalidity Benefit, Severe Disability Allowance, Jobseekers Allowance or similar benefits; also people over 60 and students in full-time education. Full-time students under 25 may also claim a further £24 discount (except for the Learn to Read Music Class). Proof is required to claim a concessionary rate. Current choir members will also receive a £20 reduction in their fee (the following term) if they introduce a new member who enrols in a choir! If a member does not take up a place or complete a term for any reason (other than the above) there is no entitlement to a refund. You can however opt to transfer your fee to the following term, but we do ask you to return the current term's music before this is confirmed. If you wish to transfer to another choir or class you need to consult our Membership Coordinator, and any difference in the fee or subscription must be paid or be refunded. If you require a receipt for your postal enrolment, you will need to enclose a stamped self-addressed envelope. If you are a taxpayer, current legislation allows us to reclaim basic rate income tax on your membership subscriptions (however not on CDs, class fees or tuition elements). When enrolling online, please read the Gift Aid information and tick the box if you are happy for us to do this. Remember to notify us if you no longer pay an amount of income tax and/or capital gains tax equal to the tax we can reclaim on your donations. Once you have enrolled in a choir or class, you will be eligible to access the Members' area on the AS website and added to the mailing list to receive e-mail information about choir activities, social and other events. An online resource only, you can access information sheets, publicity posters, the Newsletters, photos of concerts, additional trips and social events. This helps us reduce postal costs and speeds up communication about choir events. The Membership Coordinator will send you an email with an invitation to join and give you a pre-selected password that you can change to a more memorable version once you are logged in.